Dori Hoch is a retired elementary teacher and reading specialist who has always enjoyed writing and teaching students to write well. She belongs to a local writers group, is a fellow of the National Writing Project, and has taught many years in the Young Writers/Young Readers Summer Enrichment Program at Kutztown Elementary School. Living in Berks County, Pennsylvania, she has been fascinated with the local abandoned or renovated one-room schools that are scattered throughout the countryside and by stories she heard at family picnics about the “good old fashioned school days”. Her first book, Pearl of Richmond School, published in 2014, was written to inform and reminisce the life of one-room school students in rural America in the early 1900’s. Hoch had an article featured in the February, 2004 edition of Berks County Living Magazine about her visit to local Mennonite one-room school entitled, “Simply Schooled in One-Room Style”. 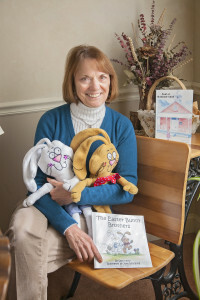 Her second book, The Easter Bunny Brothers, was written as an entertaining story for her grandchildren. It was released in the spring of 2015. Jane Wolfgang’s colorful illustrations bring Bobby and Benjamin to life as they struggle with sibling rivalry, problem solving and team work. A sequel, The Bunny Brothers’ First Thanksgiving, was released for the fall of 2015. In this humorous tale, Bobby and Benjamin Bunny want to celebrate Thanksgiving just like the Pilgrims and Indians of long ago. Taking their bows and arrows, the two bunny brothers set off to find a turkey. Once again, Jane Wolfgang’s illustrations add detail and humor to the story as they struggle with problem solving, team work, and risk taking. In January of 2016 Hoch with illustrator Ruth Williams released a second Pearl book entitled Pearl and the Schoolyard Prank. In this book Pearl learns an important lesson about telling the truth and helps her cousin learn it as well. Some common games played in the one-room schools are included in the back of the book. In the fall of 2016, A Bunny Brothers’ Christmas was published. In this book Bobby and Benjamin Bunny are at it again. This time they both want a toy train just like their friend Tom Turkey’s. Bobby gets up and sees Santa delivering the trains, but problems abound. Bobby and Benjamin learn a very important lesson about what Christmas is all about. Can you believe it? Bobby and Benjamin Bunny are at it again. In the fall of 2017, The Bunny Brothers: Lost in the Woods was released. Going for a hike in the woods that surround their burrow, the brothers become lost. With some interesting twists and a surprise visitor, Bobby comes up with a plan. By working together the bunny brothers find their way home and learn the importance of following safety signs. A fifth Bunny Brother book is in the works. Bobby and Benjamin will be getting a baby sister! As usual, problems abound. The expected release date is the fall of 2019. Dori Hoch is available for school, library, and historical society visits. Her Bunny Brother series are perfect for pre-school through second grade. Her Pearl books are appropriate for middle elementary grades and work well with historical societies and senior gatherings.